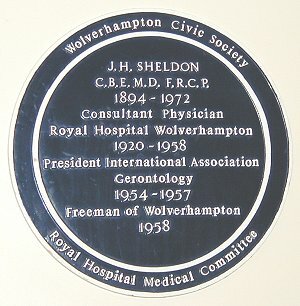 Joseph Harold Sheldon came to Wolverhampton as an honorary physician in 1921, having already won several prizes and scholarships. His two brothers were also doctors, one a physician to the Queen and the other a G.P. 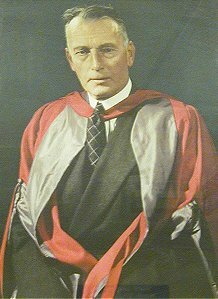 Joseph became Hunterian Professor to the Royal College of Surgeons in 1928. Seven years later he published his classic work on haemochromatosis. Thoughtful of his patients, he carried out patient clinics on market days, seeing up to 45 new out-patients in a morning. He was elected President of the International Association of Gerontology in 1954, awarded the CBE on 1955 and made a freeman of Wolverhampton in 1958. 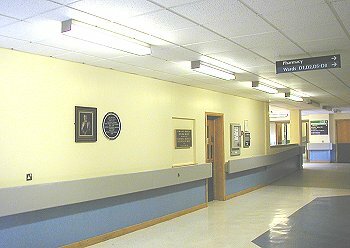 The plaque is located in the Sheldon Building, at the side of the picture above.